However, when his wife Mona (Alice Eve) and their three children are killed in a tragic car accident, he refuses to accept the truth. With help from his best friend and fellow scientist Ed Whittle (Thomas Middleditch), Foster replicates all four by cloning their bodies and teleporting their minds into the new bodies. 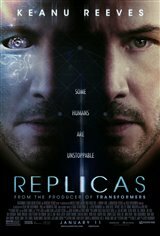 Canadian Connection: Keanu Reeves was raised in Toronto. He began his acting career with guest roles on Canadian television series.